Labor leaders on Wednesday protested the Education Department’s unilateral implementation of a new collective bargaining agreement without buy-in of the agency’s union, and demanded negotiations on a new contract resume. Demonstrating outside of agency headquarters, officials decried the decision earlier this month to impose a new “management edict” that stripped decades of union precedent and removed agreements on telework, step increases and bonuses, and stripped the union of its in-house office space and ability to use official time. AFGE officials said management left ground rule negotiations after about six months and then, instead of filing an impasse as is traditional when discussions break down, informed the union that it had drafted a new contract on its own in February. Union members voted overwhelmingly against the new deal, which replaced a 44-article agreement with a much narrower document, but the agency implemented it anyway on March 12. 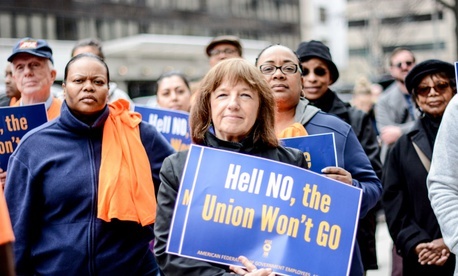 Sharon Harris, president of AFGE Local 476 and a retired employee based at Education Department headquarters, said management’s contributions to ground-rule negotiations, which took place across seven three-day sessions in Washington, were haphazard and chaotic. Young, who works on federal student aid in the agency’s Chicago office, said life under the new contract seems designed to make it intentionally difficult for union officials to represent employees, which is required by law, regardless of whether the employee is a dues-paying member. The agency is rescinding office space previously designated for union use and taking back computers and other equipment, and although the new contract allows for 10 union stewards, management is only recognizing Young, requiring all grievances and other correspondence to go directly through her. Without on-campus office space or agency equipment, Young said she must print out any documents she needs and then take them home. To make matters worse, she feels she is being retaliated against for her union activities, in part because management has not yet set up her desk or computer equipment despite the fact she was taken off 100 percent official time earlier this month. AFGE filed an unfair labor practice against the Education Department earlier this month. Young said the Federal Labor Relations Authority has begun investigating the matter, but that they have not provided a timetable for resolution. According to a memo sent to Young this month, in addition to ending official time altogether, she can take a maximum of 50 percent of her time for leave without pay for union activities. An additional “leave bank” can be distributed to up to nine representatives—one for each region—at Young’s discretion. The agency also canceled all agency-hosted union local email addresses, except the Council 252 email.